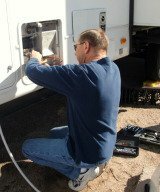 Should you buy a portable washer dryer combo for your RV? While there is no one right answer, we personally couldn't get along without ours. One of the main concerns is space. Space is always critical for full-timers. Our fifth-wheel has a closet specifically designed for RV washing machines, but lots of RVs will have to sacrifice some closet space in order to accommodate RV washers. For the first six months we were full time Rving we didn't have an RV washer in our fifth-wheel. We used a very clean and very close public Laundromat which was only two miles from our RV park. It was working out okay, but dragging the laundry in and out of the trailer was the worst part of the whole ordeal. We decided to purchase the Splendide 2100XC Washer/Dryer in white from Camping World. If you're planning on having Camping World install your Splendide washer dryer it will cost you a little extra. The Camping World we bought ours from used an outside vendor to do the installation and we had all kinds of problems. First they didn't cut a vent hole and install the vent, and secondly they didn't remove the drum stabilizers! Our first attempt to use the RV washer ended up with the thing walking right out the closet! Once everything was correctly connected and installed though it was working great. Some of the older model Splendide Combo washer dryers have a smaller washing capacity and tend to wrinkle the clothes pretty bad; especially if they are overloaded. Our model the 2100XC has a larger capacity and doesn't wrinkle the clothes if you remove them promptly after the cycle is completed they come out looking really great. Here's the description of the portable washer dryer combo we have: Splendide 2100XC Washer/Dryer - White Extra-capacity drum washes 20% bigger loads then dries them up to 35% faster. Washes up to 15 lbs. of laundry; dries up to 11 lbs. Redesigned vented drying system dries laundry up to 35% faster than previous models. LED display up-to-the-minute cycle status. Larger 11 1/2" dia. door opening makes loading and unloading easier. Heavier-duty internal components add durability for RV or marine use. Silent, brushless AC motor makes this the quietest RV washer/dryer combo available today. Unique Add-An-Item feature lets you add laundry during the cycle. Fits easily into cut-out space of previous model yet weighs 13 lbs. less. Unit dimensions are 33 1/8"H x 23 1/2"W x 23 3/8"D.
It is so nice not to have to lug clothes to the laundry anymore. We can even wash towels in ours if we're only doing two towels; which is usually all we have anyway. We don't recommend doing blankets, rugs, or pet bedding in your washer dryer though. You should still plan on a trip to the Laundromat for those items. 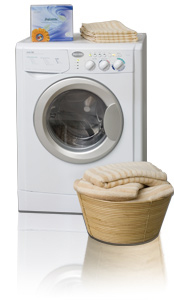 Bottom line and our opinion - we're big fans of the Splendide portable washer dryer combo!